Why have tens of thousands of car buyers made the switch to compact cars as their vehicle of choice? While every consumer's exact reasons are different, the combination of great performance and sleek designs are a common theme among all. 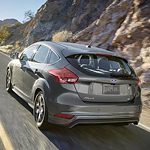 That is why our team of compact car experts here at Mullinax Ford of Kissimmee are excited to tell you all about the design features of the brand new 2018 Ford Focus. The Focus is available to consumers in more than a dozen base colors so that consumers can select one that best matches their personal style. Also, drivers have the option to add premium wheels ranging in sizes from fifteen to nineteen inches. Finally, drivers will love the interior of the car which has been designed with a variety of features including a 10 speaker sound system that will allow you to hear your favorite songs like never before.